The first month of the First World War saw little naval action in the North Sea. Kaiser Wilhelm II was unwilling the risk the German fleet in action. Admiral Alfred von Tirpitz, the architect of the German fleet thought that ‘it was simply nonsense to pack the fleet in cotton wool’, but his job was largely administrative and gave him little input into strategy. Wilhelm and his Chancellor Theobald von Bethman Hollweg wanted to preserve the fleet as a post war bargaining counter. The German generals saw the navy’s role as protecting the army’s flank and stopping amphibious assaults by the British on Germany’s North Sea coast or the Russians in the Baltic. The German navy had expected the British to carry out a close blockade of the Helgoland Bight, which would allow the Germans to whittle down the Royal Navy (RN). However, the RN instead conducted a distant blockade of the North Sea. The RN had assumed that the Germans would come out and challenge it at the start of the war. Admiral Sir William James, a Commander in 1914 who served in Naval Intelligence and the Room 40 code-breaking centre later in the war, told the naval historian Arthur Marder that ‘[r]epeated [German] excursions might have seriously weakened us.’ Marder notes that the Germans failed to use the major advantage that the use of Zeppelins for reconnaissance would have given them. By 19 August the bulk of the British Expeditionary Force (BEF) had been transported to the Continent. The RN closed the English Channel to raiders and the Grand Fleet was positioned to prevent the German High Seas Fleet from interfering with the transports. Admiral Reinhard Scheer, then commanding the German Second Battle Squadron, described the idea that the Germans might have attacked the British supply lines as a ‘totally impossible demand’ that would have led to heavy German losses. Some of the more aggressive British officers wanted to take action. These included Commodores Roger Keyes and Reginald Tyrwhitt, commanding respectively the submarines and destroyers at Harwich, and Vice Admiral Sir David Beatty, commanding the Grand Fleet’s battlecruisers. Keyes’s submarines gathered useful intelligence about the organisation of German patrols. He put forward his plan, supported by Tyrwhitt, on 23 August. Three surfaced submarines would be placed 40 miles off Helgoland in order to draw out the German destroyers. They would then be attacked by Tyrwhitt’s 1st and 3rd destroyers flotillas, each led by a light cruiser. Three more submarines would lie submerged closer in to the coast in order to attack any German cruisers that came out to support their destroyers and two more would be placed at the mouth of the River Ems. The battlecruisers HMS Invincible and New Zealand, which had recently moved to the Humber under the command of Rear Admiral Archibald Gordon Moore, would give support. Five old Cressy class armoured cruisers would be held in reserve under the command of Rear Admiral Arthur Christian. On 24 August it was decided to carry out Keyes’s plan four days later. Admiral Sir John Jellicoe, the commander of the Grand Fleet, was not informed until 26 August. He suggested bringing the Grand Fleet south in support; he was told that this was unnecessary, but that his battlecruisers could ‘support if convenient.’ On the morning of 27 August he sent Beatty’s three battlecruisers and Commodore William Goodenough’s six light cruisers south. The signal informing the local commanders that Beatty and Goodenough’s ships were supporting them reached Christian but not Keyes or Tyrwhitt. This nearly led to Goodenough’s light cruisers being fired upon by other British ships. The Battle of Helgoland Bight is described by Paul Halpern as being ‘a most confusing encounter.’ Fog and haze restricted visibility and restricted the involvement of the German shore batteries. The tides meant that German capital ships could not cross the Jade Bar and put to sea in the morning. Marder wonders if this ‘may have been lucky for the attackers (or was it foresight in planning? ).’ Most other writers, including Sir Julian Corbett, the official historian, mention this fact without giving any indication whether it was due to luck or judgement. However, Robert Massie notes that Beatty had a set of the German coastal tide tables. Tyrwhitt had the Third Flotilla of 16 modern L class destroyers and his flagship the brand new light cruiser HMS Arethusa (2 6 inch, 6 4 inch guns, 4 21 inch torpedo tubes) along with the First Flotilla of the light cruiser HMS Fearless (10 4 inch guns, 2 18 inch torpedo tubes) and 15 older destroyers. The First Flotilla’s other four destroyers were with the Humber battlecruisers. Keyes flew his flag in the destroyer HMS Lurcher, which was accompanied by the destroyer HMS Firedrake. Tyrwhitt’s force first sighted a German destroyer at 7 am and was soon engaged with ten enemy destroyers. Two German light cruisers, SMS Stettin and Frauenlob (both 10 4.1 inch guns, 2 17.7 inch torpedo tubes) appeared about 8 am. They easily outgunned the British destroyers and were similarly armed to Fearless. Arethusa was theoretically more powerful, but was new and not fully worked up. However, Goodenough’s Town class light cruisers had 6 inch guns, making them far more powerful than the German cruisers. The British destroyers fell back on Arethusa and Fearless. Stettin withdrew after covering the withdrawal of the German destroyers. Arethusa was reduced to 10 knots and one 6 inch gun because of damage inflicted by Frauenlob and gun jams, but was able to damage Frauenlob so badly that she retired. The only German ship sunk in this part of the battle was the destroyer V187. The action was very confused because of the poor visibility and poor co-ordination by both sides. Keyes had not been informed that Goodenough’s squadron was in the area, so assumed that HMS Nottingham and Lowestoft were German when he first saw them. The submarine E6 fired a torpedo at HMS Southampton, which then tried to ram E6. Neither vessel was damaged. By 10:40 am Arethusa had restored her speed to 20 knots and brought all four of her 4 inch guns back into action. Eight more German light cruisers had by then left harbour, but Rear Admiral Leberecht Maass, their commander, committed them piecemeal. By 11 am Tyrwhitt’s flotillas were engaged with four German light cruisers; SMS Stettin, Strassburg and Ariadne and Köln: some sources call the last named ship Cöln, but I have used the current spelling of the city’s name. A fifth, Mainz, was on the way. All were armed with 4.1 guns, but the British wrongly identified Köln as a much more powerful armoured cruiser. Beatty ordered Goodenough to send two of his cruisers to support Tyrwhitt, but Tyrwhitt took all his squadron. Beatty was concerned that the British light forces might be overwhelmed, but also of the risk to his battlecruisers from mines, U-boats, enemy capital ships and even mis-identification by British submarines. Beatty said to his Flag Captain Ernle Chatfield that ‘if I lose of these valuable ships the country will not forgive me.’ Chatfield replied that ‘surely we must go’, which convinced Beatty to order all five battlecruisers to head for the action at full speed at 11:35 am. They arrived at 12:37 pm and withdrew at 1:10 pm. By then Köln, Mainz and Ariadne were sunk or sinking. The first two German battlecruisers SMS Moltke and Von der Tann did not cross the Jade Bar until 2:10 pm. They were ordered by Rear Admiral Franz Hipper, commanding the German battlecruisers, not to engage the enemy until he joined them with his flagship SMS Seydlitz, which was an hour behind. He did not want to repeat Maas’s error of feeding in his ships piecemeal. Helgoland Bight was a clear British victory: three German light cruisers and a destroyer were sunk and three light cruisers damaged, with 1,242 Germans were killed, capture or wounded. Maas was amongst the dead. Only one member of Köln’s crew survived. Others abandoned ship but the Germans did not search the area for three days, by when all the rest were dead. The British had one light cruiser and three destroyers damaged but lost no ships. 35 British sailors were killed and 40 wounded. Despite this, the British made a number of mistakes. There was little co-ordination between the different squadrons and flotillas and communications were poor. As well as the failure to tell Keyes and Tyrwhitt that they were being supported by Beatty and Goodenough, Keyes and Tyrwhitt did not give the speeds and courses of their ships when requesting support. The Germans concluded that their system of patrol lines was a mistake and replaced them with minefields. In future there would always be at least four capital ships outside the Jade Bar, with all at two hours’ notice for steaming. The Kaiser became even more determined not to risk his ships. He ordered that the commander in chief of the High Seas Fleet should ask his permission before taking part in a fleet action. Quoted in A. J. Marder, From the Dreadnought to Scapa Flow; the Royal Navy in the Fisher Era, 1904-1919, 5 vols. (London: Oxford University Press, 1961-70). i, p. 43. Quoted in P. G. Halpern, A Naval History of World War I (London: UCL Press, 1994), p. 29. Marder, From. i, p. 52. G. Bennett, Naval Battles of the First World War (London: Pan, 1983), p. 133; J. S. Corbett, H. Newbolt, Naval Operations, 5 vols. (London: HMSO, 1938). i, p. 119; Halpern, Naval, p. 31; R. K. Massie, Castles of Steel: Britain, Germany, and the Winning of the Great War at Sea (London: Jonathan Cape, 2004), p. 107. Quoted in Marder, From. i, p. 52. Corbett, Newbolt, Naval. i, p. 119 and footnote 1. In 1914 both Britain and Germany armed merchantmen. British armed merchant cruisers were intended to protect trade and to enforce the blockade of Germany. The German equivalents were commerce raiders. The only commerce raider to leave a German port and slip out past the British blockade in August 1914 was the Norddeutscher Lloyd Line’s 14,000 ton Kaiser Wilhelm der Grosse, commanded by Kapitän Max Reymann. The other early German merchant cruisers were abroad at the start of the war and were armed by German warships. She was capable of 22.5 knots and on her maiden voyage in 1897 won the Blue Riband for the fastest crossing of the Atlantic. As a merchant cruiser she was armed with six 105mm (4.1 inch) and two 37mm (1.5 inch) guns. Her main weakness was her high coal consumption. On 7 August, three days after leaving Hamburg, the Kaiser Wilhelm captured and sank the steam trawler Tubal Cain, whose crew were taken on board the German ship. A week later the Kaiser Wilhelm picked up a signal from the British liner Galician, which was concerned about the threat of German commerce cruisers near Tenerife. The German ship sent her a reassuring message and then intercepted her on the afternoon of 15 August. The Galician was carrying a general cargo and nine first class and 30 second class passengers. Reymann had her wireless disabled and took off two of her passengers, Lieutenant J Deane of the First Battalion East Lancashire Regiment and Gunner C Shurmer of the Royal Garrison Artillery. At 5 am on 16 August Reymann allowed the Galician to go with the following signal: ‘I will not destroy your ship on account of the women and children on board. You are dismissed. Good-bye.’ Click here for a film reconstruction of the incident. On 16 August Kaiser Wilhelm intercepted three British merchantmen. The Kaipara and Nyanga were sunk after the 101 men on board them had been transferred to the German ship. The third ship, the modern Royal Mail steamer Arlanza, had women and children amongst her passengers. Reymann allowed her to go after she threw her wireless overboard. The Galician made Tenerife on 16 August and informed the Admiralty of the presence of the German raider. The Galician was able to rig up an emergency wireless with help of some spare parts obtained at Tenerife. The Arlanza was also able to set up a replacement wireless. Both ships used their temporary radios cautiously, listening for enemy signals rather than transmitting their own. The Arlanza reached Las Palmas on 17 August and sent a report to the Admiralty. Just outside the port she told the armoured cruiser HMS Cornwall what had happened. This affair shows that commerce raiders were putting themselves at risk if they released enemy merchantmen and that it was hard to silence a radio equipped ship permanently. The protected cruiser HMS Highflyer, captained by Henry Buller, was sent on 24 August to investigate a report that the Kaiser Wilhelm had been at Rio de Oro, a remote anchorage on the coast of Spanish Sahara, a week earlier. She was still there when Highflyer arrived on 26 August, re-coaling and re-provisioning from the merchant ships Arucas, Magdeburg and Bethania. A fourth merchantman, the Duala, had returned to Las Palmas. The Kaiser Wilhelm was hopelessly outgunned by Highflyer’s 11 6 inch guns, nine 12 pounders, six 3 pounders and two 18 inch torpedo tubes. She was faster than the British ship’s 20 knots, but could not flee as she did not have steam up. The three merchant ships fled; Reymann had transferred his prisoners to the Arucas, who were released when she reached Las Palmas on 28 August. The Bethania was heading for Charleston in the USA with 450 of Kaiser Wilhelm’s crew, but she was captured by HMS Essex on 7 September. After an hour and a half the Germans scuttled and abandoned their ship. The British Official History states that Buller left them because they took up ‘a menacing position behind the sandhill.’ British casualties were one man killed and five wounded. The damage to Highflyer was too minor for her to need dockyard repair. This website says that Reymann worked his passage back to Germany as a stoker on a neutral vessel. Both sides breached Spanish neutrality in this action, the Germans by using the harbour as a base and the British by attacking them; the Spanish protested to both. The Admiralty concluded that Captain Buller was correct in attacking, since not doing so would have invited commerce raiders to use other remote anchorages in neutral countries that lacked the naval strength to enforce their neutrality. Spain accepted the British apology. The Kaiser Wilhelm der Grosse’s cruise was notable mainly for Reymann’s chivalry. His ship sank only three merchant ships with a total tonnage of 10,685 tons; the ships and their cargoes were worth under £400,000. Later in the war, the Germans would find that innocuous looking freighters were better commerce raiders than fast liners with a high coal consumption. C. E. Fayle, Seaborne Trade., 3 vols. (London: HMSO, 1920). i, p. 79. J. S. Corbett, H. Newbolt, Naval Operations, 5 vols. (London: HMSO, 1938)., i, p. 136, footnote. Figures from Fayle, Seaborne. i, p. 82. Tagged as Battle of Rio D'Oro, commerce raider, First World War, Great War, HMS Highflyer, Kaiser Wilhelm der Grosse, Max Reymann, war at sea, WWI. WW! In the early hours of 26 August, the German light cruiser SMS Magdeburg ran aground at Odensholm lighthouse off Estonia whilst participating in a sweep against Russian patrols in the Gulf of Finland. The destroyer SMS V26 had to abandon her attempts to free Magdeburg when the Russian armoured cruiser Pallada and the protected cruiser Bogatyr appeared. The Germans tried to scuttle Magdeburg, but were only partially successful. One of her four copies of the Signalbuch der Kasierlichen Marine (SKM), the German navy codebook, was burnt and two thrown overboard. However, the Russians recovered the latter two from the sea and the fourth from the captain’s safe. They later scrapped Magdeburg where she lay. The Russians retained two of the codebooks for themselves and offered the third to the British, provided that a British ship collected it. This did not happen immediately, but the Admiralty received the codebook on 13 October. Winston Churchill, then First Lord of the Admiralty, later wrote that Britain ‘received from our loyal allies these sea-stained priceless documents.’ Christopher Andrew and Robert Massie both note that the copy of the SKM in the UK National Archives [ref ADM 137/4156] is not sea-stained. The Russians kept the two copies retrieved from the sea and gave the British the one from the captain’s safe. As well as the SKM codebook, the British obtained a set of the German squared charts of the North Sea and Heligoland Bight that used to identify the location of German and enemy forces. Arthur Marder writes that Churchill and The Naval Staff of the Admiralty, a Naval Staff Monograph, both state that they were provided by the Russians. However, he goes on to say that Lieutenant W. F. Clarke RNVR, who worked in codebreaking, says in an unpublished paper called ‘Jutland’ that they were from the safe fished up by the trawler. It took some time until the British could read German naval signals sent using the SKM. Weather reports were encoded only by it, but other ones were re-ciphered. By early November, Fleet Paymaster Charles Rotter, a Naval Intelligence Department German expert, had realised that the re-ciphering was a simple substitution table. The key was changed periodically, but later ones were broken more quickly. The SKM was the second German naval codebook obtained by the British. The SS Hobart, a German merchant ship, had been boarded by Australians off Melbourne on 11 August. They seized a copy of the Handelsverkehrsbuch (HV), which was used principally for communications between warships and merchantmen, but was also used by naval shore bases and later by U-boats and Zeppelins. The Australians did not initially realise the importance of their prize and it then took time to send it to Britain, so the Admiralty did not receive it until late October. The British obtained the third German naval codebook, the Verkehrsbuch (VB), when a trawler caught a lead-lined chest on 30 November. It had been thrown overboard by a German destroyer sunk on 17 October. The VB was used for cable communications with naval attachés and warships abroad and by admirals at sea. The ability to read German codes would become very significant later in the war, but it took time for the Admiralty to get its decryption operation, known as Room 40 after its original office, working well. At first, the civilian cryptographers did not always understand naval matters and some naval staff officers looked down on them. The Admiralty was also excessively secretive with the decrypts, meaning that it did not always make the best use of the intelligence. Paul Halpern comments that ‘Room 40 would not reach its peak of efficiency and become a true intelligence centre until much later in the war. W. S. Churchill, The World Crisis, 1911-1918, 5 vols (London: Odhams Press, 1939), v, Kindle edition, location 7846 out of 9432. C. M. Andrew, Secret Service: The Making of the British Intelligence Community (London: Heinemann, 1985), p. 89; R. K. Massie, Castles of Steel: Britain, Germany, and the Winning of the Great War at Sea (London: Jonathan Cape, 2004), footnote, p. 316. A. J. Marder, From the Dreadnought to Scapa Flow; the Royal Navy in the Fisher Era, 1904-1919, 5 vols (London: Oxford University Press, 1961-70), ii, footnote 2, p. 132. Marder says that Captain Stephen Roskill, whosse papers are now at Churchill College, Cambridge, had a copy of Clarke’s paper. P. G. Halpern, A Naval History of World War I (London: UCL Press, 1994), p. 37. France did not declare war on Austria-Hungary until 12 August 1914, with Britain following suit the next day. Vice Admiral Augustin Boué de Lapeyrère, the commander of Anglo-French naval forces in the Mediterranean was ordered to take the offensive against the Austro-Hungarians. His initial task of protecting French troops moving from North Africa to France had by then been largely completed. The French navy’s war plans had assumed that it would be fighting both Austria-Hungary and its ally Italy, so it had no plan to fight only Austria-Hungary. An attack on the enemy’s main base at Pola, now Pula in Croatia, was thought to be too risky. De Lapeyrère decided that a sweep into the Adriatic to relieve the Austro-Hungarians blockade of Montenegro might provoke the enemy’s main battle fleet into coming out to fight. This would give the Allies an opportunity to win a decisive victory. The Austro-Hungarian fleet was heavily outnumbered by the Allied one, which consisted mostly of French ships, but included a few British cruisers and destroyers. The British Mediterranean Fleet’s battlecruisers were watching the Dardanelles in case the German battlecruiser SMS Goeben and light cruiser SMS Breslau came out. Other British ships had been sent to the Red Sea in case German cruisers attempted to attack troopships heading from India to Egypt. De Lapeyrère’s plan was to take his main battle fleet, showing no lights, along the Italian coast as far as the latitude of the Austrian base at Cattaro, now Kotor in Montenegro. They would then head towards Cattaro and destroy the Austro-Hungarian blockade force, which would have been driven towards them by a force of light cruisers commanded by the British Rear Admiral Ernest Troubridge. The trap swung shut on 16 August, but caught only the small and old Austro-Hungarian light cruiser SMS Zenta. It fought gallantly but was overwhelmed and sunk in ten minutes. The action was sufficiently close to the coast that the survivors were able to make the shore. A destroyer escaped. The Austro-Hungarian naval plan was to maintain a fleet in being. The Allies were hampered by a lack of bases and the French navy’s shortage of colliers and oilers to fuel a fleet that consumed 5,000 tons of coal and 1,000 tons of oil per day. De Lapeyrère was forced to rotate his ships between the Adriatic and Malta. P. G. Halpern, A Naval History of World War I (London: UCL Press, 1994), p. 59. At the outbreak of war the Royal Navy’s Mediterranean Fleet was commanded by Admiral Sir Archibald Berkley Milne, a well connected officer whose career had benefitted from his service on the royal yacht. His father had commanded the RN’s North America and West Indies Station during the American Civil War and his grandfather had also been an admiral. The German Mediterranean squadron, commanded by Rear Admiral Wilhelm Souchon, consisted of the battlecruiser SMS Goeben and the light cruiser SMS Breslau. Goeben was armed with 11 inch guns compared with the 12 inch guns of the three British battlecruisers, HMS Inflexible, Indefatigable and Indomitable, in the Mediterranean. However, she had 12 of them compared with eight in the British ships and was faster and better armoured than them. Rear Admiral Ernest Troubridge’s First Cruiser Squadron included four armoured cruisers, HMS Defence, Black Prince, Duke of Edinburgh and Warrior. They were armed with 9.2 inch and either 6 inch or 7.5 inch guns. Breslau was faster than the four British light cruisers, but was armed with 12 4.1 inch guns compared with HMS Gloucester‘s two 6 inch and 10 4 inch and the other three British ships’ eight 6 inch guns. The British also had 16 destroyers, but they were of the relatively slow Beagle class, the last coal fired British destroyers. The bulk of the French navy was in the Mediterranean under the command of Vice Admiral Augustin Boué de Lapeyrère. He had been Minister of Marine from 1909-11, producing a coherent plan for the expansion of the French navy after a period in which it lacked a strategy because of frequent change in the Minister of Marine. De Lapeyrère divided the French Mediterranean fleet, the 1ère armée navale into three group. One consisted of six semi-dreadnoughts, three armoured cruisers and twelve destroyers; the second of a dreadnought, five pre-dreadnoughts, three armoured cruisers and twelve destroyers; and the last of four older pre-dreadnoughts. Its main task at the outbreak of war was to protect the transit of the French XIX Corps from Algeria to France. The two sides would have been evenly balanced had Italy entered the war on the side of its Triple Alliance, but it declared its neutrality on 2 August. Fear that the long Italian coastline was vulnerable to Anglo-French naval attacks was a factor in this decision. It was justified on the grounds that the alliance was defensive and Austria-Hungary was the aggressor in the war. Robert Halpern describes Italian neutrality in 1914 ‘as being one of their biggest services to the British and French during the war.’ See this post for the naval balance in 1914. As well as meaning that his fleet was outnumbered, Italian neutrality restricted the options open to the Austro-Hungarian fleet commander Admiral Anton Haus. He could have moved his fleet into the Mediterranean had Italy been allied to Austria-Hungary, but the location of its only major base at Pola, now Pula in Croatia, meant that it was now restricted to the Adriatic. The Chief of the Austrian General Staff Field Marshall Franz Conrad von Hötzendorff, supported by Foreign Minister Count Leopold Berchtold, wanted the fleet to move to the Black Sea to operate against the Russians. He feared that it would soon be destroyed by the Anglo-French fleet. Haus rejected this: his fleet would lack bases, coal stocks and a fleet train in the Black Sea; the Allies might destroy it in transit; and the Austro-Hungarian Adriatic coast would be left unprotected. Goeben was at Pola undergoing repairs to her boilers when Austria-Hungary declared war on Serbia on 28 July. Souchon, according to Robert Massie, did not want to be ‘subordinate to an Austrian admiral not inclined to fight Britain and France.’ He therefore sailed the next day with the repairs incomplete. He had difficulties obtaining coal from Italian ports, but replenished his supplies from German merchant ships at Messina. On the evening of 3 August, the day that Germany declared war on France, Goeben and Breslau fired the first shots of the naval war when they bombarded the French ports of Philippeville and Bône in Algeria. Souchon’s subsequent options appeared to be to attempt to exit the Mediterranean via the Straits of Gibraltar or to return to Pola, possibly first attacking the French troop transports. Unknown to the Allies, Germany and the Ottoman Empire had signed an alliance on 2 August. In the early hours of 4 August Souchon received a signal ordering him to make for Constantinople, now Istanbul. Goeben did not have enough coal to make the voyage at its normal cruising speed, so he ordered a return to Messina to refuel. At 10:46 am on 4 August Indomitable and Indefatigable reported that they had sighted Goeben and Breslau. Britain and Germany were not yet at war, but the British ships, later joined by the light cruiser HMS Dublin, tailed the German ones. The British battlecruisers could not keep up with the Germans, losing sight of them at 5 pm. Dublin stayed in touch with them until 10:25 pm. The British vessels needed their hulls to be de-fouled and their engines overhauled. They had peace rather than war complements, which meant that they were short of stokers. Coal fired ships needed more stokers in order to maintain full speed, so carried more in wartime than in peacetime. Indomitable reported that the Germans were making 26-27 knots. Arthur Marder says that Goeben ‘managed to increase her speed to 24 knots for a short period. Her mean speed from noon to 8 pm was 22.5 knot.’ This exaggeration of the speed of the German ships would have consequences later. War between Britain and Germany began at 11 pm British time (midnight Central European) on 4 August, but neither Britain nor France was yet at war with Austria-Hungary. The German ships reached Messina in the early hours of 5 August. Milne argued that his orders to stay more than six miles from the Italian coast meant that he could not follow the Germans into the straits of Messina because they were only two miles wide. He further claimed that the Germans could have escaped from any ship more than six miles from the Italian coast because of their greater speed. Milne expected Souchon move north out of the Straits of Messina, head west and attack the French troop transports. Alternatively, he could take the south exit and head for the Adriatic. Milne took his flagship HMS Inflexible to join Indefatigable well to the west of the Straits of Messina. Indomitable was sent to Bizerte to refill her coal bunkers. 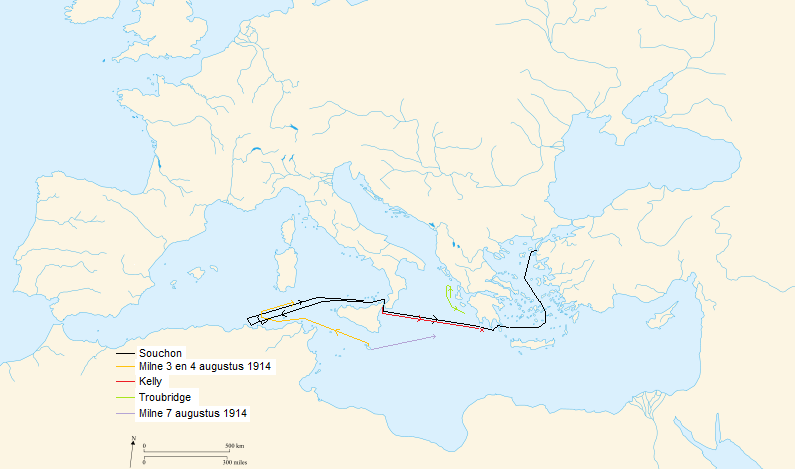 Troubridge and his armoured cruisers were near Corfu in case Souchon headed for the Adriatic. The light cruiser HMS Gloucester was the closest British warship to Messina, covering the south exit. Milne appeared not to realise that the troopships were now sufficiently protected since at 4:33 pm he offered the French the assistance of ‘two battle-cruisers and 1 light cruisers’ if the Germans had sailed undetected. Souchon sailed at 5:00 pm. His plan was to feint towards Pola, before turning towards Constantinople after dark. Half an hour after issuing his orders he was informed by the German Admiralty that ‘[a]rrival Constantinople not possible for political reasons’, but decided to go ahead anyway. Milne was informed of the German departure by Gloucester at 6:16 pm. He then headed west, as his orders prevented him entering the Straits of Messina and the Germans might still turn west towards the transports after exiting the southern end of the Straits. Too late, a signal from the Admiralty told him that ‘[i]f Goeben goes south from Messina, you should follow through the Straits, irrespective of territorial waters.’ It was sent at 7:45 pm, but not received until 10:54 pm. Gloucester, under the command of Captain Howard Kelly, followed the Germans as Goeben tried to sail as quickly as possible. Kelly managed to keep his superiors informed of the German movements despite their attempts to jam his ship’s wireless transmissions, Souchon did not know that Gloucester was alone, so could not take the chance of turning back to sink her. Unknown to Souchon, the risk of a major action had already passed. Troubridge, with his four armoured cruisers and eight destroyers, was positioned off Cephalonia, south of Corfu. However, his destroyers were short of coal. The light cruiser Dublin, captained by Howard Kelly’s brother John, and the destroyers HMS Beagle and Bulldog were on the way to join him. John Kelly intended to be in position to attack Goeben at 3:30 am on 7 August, but his ships failed to find the enemy. Troubridge at first assumed that Souchon was heading for the Adriatic and that he was heading south in order to shake off Southampton. He headed north, with the intention of engaging them in narrow waters where he could choose his range. Troubridge had earlier told Milne that ‘I consider a battle-cruiser to be a superior force to a cruiser squadron, unless they can get within their range of her.’ Milne replied ‘That question won’t arise as you will have the Indomitable and Indefatigable with you’, which in the event he did not. Although he thought that to do so would break his orders not to engage a superior force, Troubridge had reluctantly decided to attack, telling his Flag Captain Fawcet Wray at 2:45 am on 7 August that ‘[t]he Mediterranean [Fleet] will stink if we don’t attack her.’ He later explained to his court martial that thought that the Fleet ought not to have allowed Goeben to escape from the Straits of Messina. Gloucester continued to pursue the enemy. She exchanged fire with Breslau at 1:35 pm. Goeben then joined in, forcing Gloucester to withdraw, but Souchon could not afford to waste coal engaging a light cruiser. Only Breslau was hit, but she suffered no casualties and her speed was unaffected. Goeben was pushing her machinery and men to the limit. Massie says that leaks of boiling water from her partially repaired boiler tubes meant that ‘[f]our men were scalded to death.’ The chase continued until the ships reached Cape Matapan at 4:40 pm. Gloucester was almost out of coal and Kelly had been explicitly ordered by Milne to go no further. The British still had one chance. Milne took his battlecruisers east, but slowly. On 8 August, the Admiralty erroneously signalled him that Britain was at war with Austria-Hungary. An over-zealous clerk had seen a telegram prepared in advance of the declaration of war and sent it too soon. Milne therefore abandoned the chase until he was informed of the mistake. The Germans were delayed by Goeben’s need to coal, so Milne might have caught them without the 24 hour delay caused by the telegram error. They reached the Dardanelles on the evening on 10 August, still not knowing if they would be welcome, which they were. The next evening the British light cruiser HMS Weymouth, sent ahead of the battlecruisers by Milne, was turned away from the Dardanelles after being informed that Goeben and Breslau were now the Ottoman ships Yavuz Sultan Selim and Midilli. They formally changed hands on 16 August, but retained their German crews, who wore fezzes on ceremonial occasions. Souchon was appointed commander of the Ottoman fleet on 23 September. The presence of these two ships in Turks led the British keeping Indomitable, Indefatigable, Defence, Gloucester and all available destroyers in the eastern Aegean. They were nominally under de Lapeyrère’s command, but effectively the force was separate from the Allied fleet in the rest of the Mediterranean. Of the British commanders, only Howard Kelly, who was made a Companion of the Bath, came out of this well. Milne’s best option would seem to me to have been the one that Marder proposes, namely to close the north exit of the Straits of Messina with two battlecruisers and the south one with the other one and Troubridge’s squadron. Since their guns had a range of over six miles, the ships could have waited outside Italian territorial waters. Troubridge initially remained in command of the RN forces in the Aegean, but was then called in front of a Court of Inquiry. It sent him for a Court Martial, where he was defended by a leading barrister, Leslie Scott KC MP, and acquitted. This made it hard for the Admiralty to refuse him further employment, but he was giving only shore based jobs. He was knighted and finished his career with the rank of Admiral. It is difficult to see how Goeben could have kept out of the gun range of all the armoured cruisers and the torpedo range of all the light cruisers and destroyers. Any damage that reduced her speed would have enabled the British battlecruisers to catch her and steaming at full speed during a battle would have used a lot of her coal. Commenting on Troubridge’s acquittal, Rear Admiral Frederick Tudor, the Third Sea Lord, thought that Troubridge’s ships ‘stood a chance of being severely punished’ if they had attacked. but that it was ‘out of the question’ that Goeben had enough ammunition to destroyed all of them. One point that perhaps says a lot about the RN’s attitude to ship design is that the arguments over Troubridge’s conduct revolved around the relative speeds, firepower and gun ranges of the ships involved. Little was said about the Goeben’s superior armour. Wray was, according to Marder, ‘virtually ostracised’ in the RN. However, he received a number of commands during the rest of the war and was awarded the DSO when captaining HMS Talbot in the Dardanelles. He was promoted to Rear Admiral on retirement and later to Vice Admiral on the Retired List. Finally, the Admiralty must take a lot of blame. It sent a series of confusing orders instead of giving the local commanders all the facts and then leaving them to make the decisions. Its order to Milne quoted at the beginning of this post told him to avoid battle with ‘superior forces’ but to seek battle Goeben, whilst noting his squadron’s speed. Taken together these comments appear to mean that the ‘superior forces’ were the Austrian battleships, but this was not explicitly stated, resulting in Troubridge concluding that Goeben was a ‘superior force’, with which he should avoid battle. P. G. Halpern, A Naval History of World War I (London: UCL Press, 1994), p. 52. Admiralty to C.-in-C. and Admiral Superintendent, Malta, 12:55 pm 3 August 1914 quoted in Lumby, Policy, p. 157. Original Source ADM 137/19. R. K. Massie, Castles of Steel: Britain, Germany, and the Winning of the Great War at Sea (London: Jonathan Cape, 2004), p. 27. Admiralty to C.-in-C. 6:30 pm 3 August 1914 quoted in Lumby, Policy, p. 153. Original source ADM 137/19. Times in this paragraphs are from signals quoted in Ibid., pp. 163-64. Original sources Naval Staff Monograph No. 21, The Mediterranean 1914-15, Appendix B. Signal of 4:10 pm 3 August quoted in Ibid., p. 160. Original source ‘Naval Staff Monograph No. 21’, Appendix B.
 Marder, From. ii, p. 23. His source is Hermann Lorey, Der Krieg zur See, 1914-1918. Der Krieg in den turkischen Gewassern (Berlin, 1928-38, 2 vols. ), vol. i, pp. 6-7. Signal of 10:00 am 6 August 1914 quoted in Lumby, Policy, p. 170. Original source ‘Naval Staff Monograph 21’, Appendix B. Signal of 4:33 pm quoted in Ibid., p. 171. Original source ‘Naval Staff Monograph 21’, Appendix B. Quoted in J. S. Corbett, H. Newbolt, Naval Operations, 5 vols. (London: HMSO, 1938). i. p. 63. Signal of 6:16pm 6 August 1914 quoted in Lumby, Policy, p. 172. Original source ‘Naval Staff Monograph 21’, Appendix B. Signal of 7:45 pm quoted in Ibid., p. 173. Original source ADM 137/19. ‘Declaration of Captain Fawcet Wray, 3 August 1917’ Ibid., p. 404. Original source Roskill Paper, which are now ar Churchill Ciollege, Cambridge.. Quoted in Marder, From. ii. pp. 32-33. ‘Minutes commenting upon the Court Martial Proceedings, By the Third Sea Lord, 9 December 1914’ Lumby, Policy, p. 398. Original source ADM 156/76. Marder, From. ii, p. 27, note 5. The U-boat became the German navy’s main weapon in both the World Wars of the twentieth century, but Germany was initially slow to adopt the submarine. Holger Herwig notes that Admiral Alfred von Tirpitz, the architect of the German navy, favoured battleships and had little time for either cruiser warfare or submarines. The first U-boat was not completed until late 1906. Rudolf Diesel was German, but the first U-boats with diesel engines were not introduced until 1910. French submarines had used diesel engines from 1904. The switch to the diesel engine meant that the U-boat was considered a potentially decisive weapon for the first time, but against the enemy battle fleet, not merchant shipping. In 1914 Germany possessed only 24 operational boats. Another four were used for training and 16 were under construction. Only 10 of the operational boats had diesel engines; the others used Körting heavy fuel oil engines that produced a great deal of smoke and sparks. This made them very visible on the surface and required ventilation pipes; stowing these slowed diving. On 6 August 1914 the German navy sent 10 U-boats into the North Sea, but U9 had to return home early because of engine problems. Two days later the dreadnought HMS Monarch, carrying out gunnery practice near Fair Isle, between Shetland and Orkney, was narrowly missed by a torpedo fired by a U-boat. Paul Halpern comments that Roger Keyes, then Captain (S), the commander of the RN’s submarines, later wrote ‘that the fact that the Monarch was performing such a task within 500 miles of Helgoland was an example of the navy’s general ignorance of submarine powers and limitations.’ The RN had proved in 1910 that its submarines could operate more than 500 miles away from their bases, but apparently did not consider the possibility that the Germans could do the same. About dawn on 9 August the light cruiser HMS Birmingham, part of a screen 30 miles ahead of the Grand Fleet, observed through the mist a submarine stationary on the surface. The sounds of hammering coming from the submarine, which was U15, suggested that her crew were trying to repair an engine fault. Birmingham closed the range and opened fire. U15 moved forward slowly, but Birmingham rammed her and cut her in two. U15 sank with all hands. Robert Massie says that 23 men went down with her, although Conway’s All the World’s Fighting Ships 1906-1921 gives her normal crew as 29. The need for ships meant that only temporary repairs could be carried out to Birmingham at first, so she retained two scars along her bows for some months. U15’s sister boat U13 also failed to return home from the cruise, probably after hitting a mine. Not even the hardiest optimist could pretend that the submarine had vindicated its war value by this expedition. Yet, had the Germans known, the effect of the cruise had caused uneasiness to their opponents…it was confidently predicted by some – but not by naval officers – that all other U-boats would soon follow U15 to the bottom. As soon as the requirement to cover the crossing of the British Expeditionary Force to France was over, Admiral Sir John Jellicoe withdrew his Grand Fleet north west of Orkney. Future sweeps into the North Sea were carried out as quickly as possible. This German cruise featured the first attack by a submarine launched torpedo on a moving warship. The Turtle, which made several unsuccessful attacks on British ships in the American War of Independence, and the CSS Hunley, which sank the USS Housatonic in the American Civil War, attacked by attaching explosive devices to the hulls of stationary ships. U15 was the first submarine to be sunk by an enemy ship in the war. H. H. Herwig, ‘Luxury’ Fleet: The Imperial German Navy, 1888-1918 (London: Allen & Unwin, 1980), p. 88. P. G. Halpern, A Naval History of World War I (London: UCL Press, 1994), p. 29. R. Gray, Conway’s All the World’s Fighting Ships, 1906-1921 (London: Conway Maritime Press, 1985), p. 175; R. K. Massie, Castles of Steel: Britain, Germany, and the Winning of the Great War at Sea (London: Jonathan Cape, 2004), p. 79. R. H. Gibson, M. Prendergast, The German Submarine War, 1914-1918. (London: Constable, 1931), pp. 3-4.